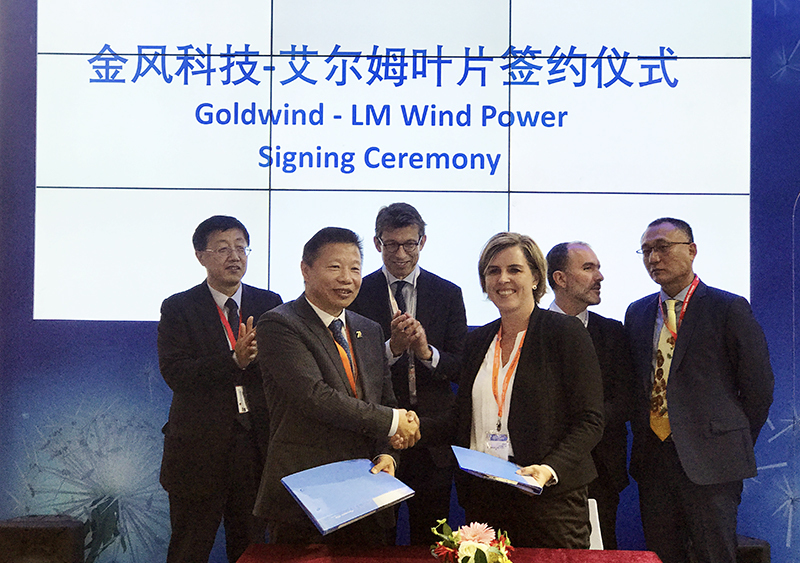 Above: On October 17 in Beijing, LM Wind Power and Goldwind executives celebrated their partnership during a signing ceremony at the China Windpower exhibition. From left to right, back row: Mr. Wu Gang, Goldwind Chairman; Duncan Berry, LM Wind Power CEO; Alexis Crama, LM Wind Power VP Offshore; Mr. Wu Kai, Goldwind Executive VP. Front row signees, left to right: Mr. Xu Lei, Goldwind Product Delivery Center GM; Dorte Kamper, LM Wind Power VP Sales & Marketing. On September 30, 2018, one day before the China National Holiday, LM Wind Power signed a three-year agreement to supply wind turbine blades for Goldwind's onshore 3-4 MW platform. The 1.1 GW agreement follows a 140 MW pre-agreement signed last year. This is the largest deal between Goldwind and LM Wind Power since 2010. This agreement covers three blade types - the LM 66.9 P, LM 66.9 P2 and LM 69.0 P - targeted for both international and the domestic China markets. Between 2018 and 2021, the blades will be manufactured at LM Wind Power's plant in Qin Huang Dao, in the northeastern part of China. Xu Lei, Goldwind Product Delivery Center General Manger, said: "This agreement is a milestone between Goldwind and LM Wind Power, setting up a successful model of strong, strategic cooperation between our two companies. Goldwind is committed to delivering turbines that meet the highest quality and reliability standards. With LM Wind Power's new 3-4 MW 66.9- and 69.0-meter blades, we know we get the quality, technology and reliable manufacturing expertise required by both the Chinese and international markets." Dorte Kamper, LM Wind Power Vice President of Sales & Marketing, said: "We are thrilled by our extended partnership with Goldwind. Our close collaboration will support their global expansion with a flexible solution where the same platform gives three variants, usable for different wind classes and different requirements." In January 2017 LM Wind Power announced that the first variant of this blade series, the LM 66.9 P, was installed successfully on Goldwind's 3 MW prototype wind turbine platform, the GW3S. Under the agreement announced today, LM Wind Power will develop the LM 66.9 P2 for stronger wind speeds and the new LM 69.0 P, which is an extension of the original 66.9-meter blade. LM Wind Power has been present in China since 2001 and currently employs more than 3000 people in the country. The company operates three blade manufacturing facilities in Qinhuangdao, Jiangyin and Baodi.